Our Wave Jacket is a comfortable and practical bomber jacket made in ultra-light and breathable nylon, equipped with an adjustable elastic hood and characterized by researched details and a strong personalization. A comfortable summer garment with medium-high neck and interior featuring intriguing and well-matched color combinations. Customized details and seams. Available in six attractive and intriguing colors. One of the most researched and requested items of the Spring Summer 2019 collection is our Wave Jacket. The constant research of the details and the strong personalization are the main characterization. This comfortable and practical bomber jacket is made in ultra-light and breathable nylon, suitable for any situation. 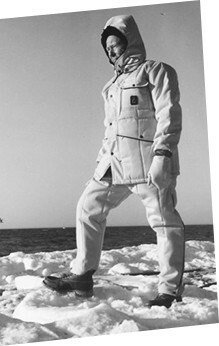 Garment equipped with every necessary comfort: an adjustable elastic hood to cover you in case of unexpected weather; side pockets with visible zip and mini-slider, perfect to safely store all of your personal items; elastic cuffs to ensure the highest coverage from the wind; and three comfortable inner pockets lined with original RefrigiWear black/silver insulating and breathable fabric. The details are cared in every aspect: logo label sewn on the iconic front pocket, equipped with flap and personalized press button in tone and with embossed logo; front closure with zipper and double custom slider for maximum comfort; interior partially lined with precise seams in contrast with the same shade of the collar. The fit is current and slightly slim, ideal for those who love a refined and never predictable look, perfect to combine over a shirt or a comfortable t-shirt for a more casual look. Available in six colors for all tastes and occasions: Silver, Olive Green, Red, Blue, Dark Blue and Black. All RefrigiWear garments are to be treated with care; a correct treatment will guarantee the maintenance of performance and appearance over time. It is recommended a hand wash with hung drying, or dry-cleaning. Use a lightly warm iron at 110 degrees if necessary. Do not bleach and do not tumble dry.